Gizycko, School tours and youth camps - discover exciting Poland with us! CAMP ALMATUR is picturesquely located on Lake Kisajno, in a resort area of 6 hectares surrounded by forest, 1,5 km from Gizycko, the biggest town in the Great Masuria Lake District. Campers preferring active rest have the possibility to participate in specific programs including; horse riding, swimming, windsurfing, yachting and recreation. Facilities include; a private marina with plenty of yachts, paddle boats and kayaks. All water sport equipment is available for our campers. This camp is a perfect offer for the outdoor type, water sports enthusiasts and nature lovers, who can all benefit from these attractions. Accommodation: Camp Almatur consists of pavilions; 5 person rooms with bathroom. Cottage type BRDA 2, 3 person rooms. Toilets and showers are available in the shower block. On the youngsters' yachting course, participants are accommodated on board. Dining: full board (3 course menu) in the dining room of the boarding house. The program begins with supper on arrival and finishes with breakfast on departure, plus a packed lunch for the journey. These lunches are also provided for the all day excursions, as well as a hot supper upon return. We also offer sailing camp meals prepared by our younger guests. Transport: bus, all necessary transfers in Poland. The price includes: accommodation (11 nights), meals, instructors and camp counselors care, health care, program and transport. The camp is suitable for beginners. If you are an absolute beginner and want to learn windsurfing we can make it happen. The camps are run on Lake Giżycko because the weather and windsurfing conditions are good here . All participants should be able to swim. We offer new boards bringing maximum performance to the recreational sailor and of course sails. Life- jackets are obligatory during all training. We also provide wet suits for participants. The following sporting activities are organized at the camp: canoing, yachting, paddle-boating, catamaran sailing and motor boat use, with all the equipment available at the camp. This camp is a perfect offer for an activity holiday, as well as sport and recreational training. After training sessions during the day, there still will be enough time to sunbathe on the lake beach or go to a swimming pool or gym in the case of rain. Moreover, there will be some sports competitions ,either in an open stadium or in a sports hall. The camp is suitable for experienced young people. The cruise follows a route through the most beautiful Polish lakes in the Masuria Region. Accommodation on the yacht is in passenger cabins and meals are prepared by the crews with food supplied by the organizer. Moreover we organize some unforgettable camp-fire get togethers with traditional, grilled Polish sausages. 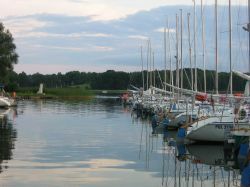 This is the ideal holiday for improving your sailing skills and visiting the northern part of Poland, known as 'The Land of a Thousand Lakes'. Participants are under the care and supervision of our experienced staff at all times .